Fujitsu isn't necessarily the first name that springs to mind when looking to buy a new laptop, but with their Lifebook range, they've put together a well thought out and pretty well specced series of notebooks. The AH512 continues this trend, coming in the standard 15.6" size display, and providing an Intel Pentium B960 2.2GHz, 4GB of RAM and a 320GB hard drive running Windows 8, for under £350. 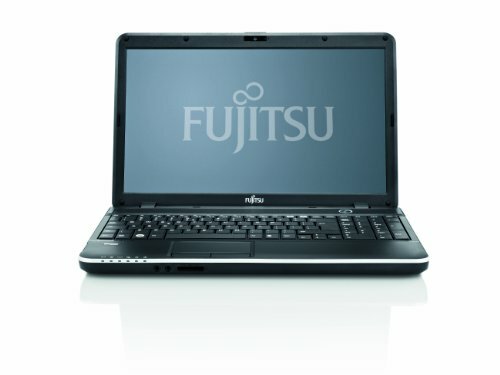 Read on for our Fujitsu Lifebook AH512 review. Below is our review of the Fujitsu Lifebook AH512, a 15.6" laptop, featuring 4GB RAM, 320GB hard drive and Windows 8. Here we have Fujitsu's latest offering to the notebook market place, launched as part of their Lifebook range. Finished in matte black, the AH512 features the Intel Pentium B960 chipset, a dual core processor featured mainly in lower end notebooks laptops, roughly based on the Sandy Bridge architecture. It features a clock rate of 2.2GHz (2200 MHz), a Level 1 cache of 128KB, Level 2 cache of 512KB and a Level 3 cache of 2048KB, and is further backed up by 4GB of DDR3 RAM. Overall the laptop was surprisingly fast - we are frequently surprised by just how fast lower end entry level notebooks have become over the years - running faster than high end laptops of just a few years back. It handled multitasking applications pretty well - in fairness it's probably not going to be able to handle the latest games at the highest graphical settings, but considering the low price, it runs pretty fast. In terms of storage Fujitsu have installed a 320GB hard drive, which although is slightly less space than some of it's rivals by other manufacturers, offers in reality more than enough storage for the vast majority of users. The display, as mentioned, is a 15.6" LCD screen and offers a decent picture overall. Sharp graphics and rich colours were some of the positive comments from our testers. The resolution is 1366 pixels by 768 pixels, and is in the 16:9 format. The keyboard, complete with number pad, features a black layout, and offers an easy and comfortable typing experience - and the touch pad provided a responsive input - no issues here whatsoever. In terms of input you're presented with headphone, microphone, multi-card reader, VGA, Ethernet (RJ45), HDMI, 3 x USB 2.0, DVD drive and Express card slots (34mm/54mm). There is unfortunately no USB 3.0 port, but you can upgrade to this via one of the express slots if you so wish. Battery life was provided by a 6 cell Li-Ion 4400 mAh unit, offering around 4 hours of power during average use - not bad at all for a budget laptop - and in terms of size this laptop is highly portable - measuring just 37.8cm by 25.2cm by 3.6cm and weighing around 2.5kg. So overall what did we make of the relatively cheap AH512? Very good specification, especially considering the low price. Overall a good solid budget laptop - if you've got around £350 to spend on a laptop, then have a look at the AH512; this notebook offers good value and a decent specification.